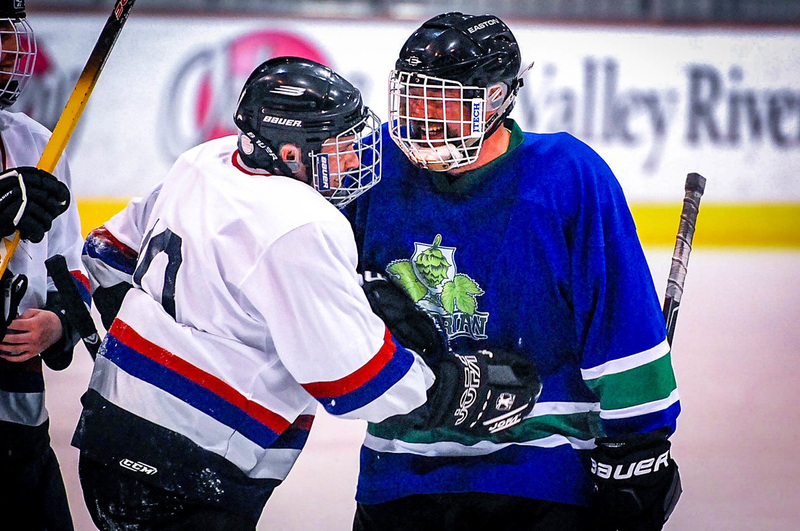 Adult Intro to Hockey Classes are a series of 8 Week Progressive Classes for ages 18+ who are interested in developing hockey skills with the goal of playing in the in-house adult hockey league - The RHL (Rink Exchange Hockey League) at the Novice (C) Level. Each class takes place once a week for one (1) hour. Gear rental is available on a first come first serve basis. All participants of Adult Intro to Hockey MUST have a valid 2018-2019 USA Hockey Membership number. You can register for a USA Hockey Membership number at www.usahockeyregistration.com. At the Beginner Level, no skating experience is necessary. This class is designed to teach early fundamental skating skills - balance, proper falling, forward skating, backward skating, turns, stops, and very basic pucks skills - while getting you introduced to some of hockey's basic concepts. At this level, players must have achieved the Beginner Level or have similar previous experience. This class will build upon the skating skills developed at the Beginner Level and add crossovers (backwards and forwards), advanced stops, stick handling, passing and shooting. At this level, players must have achieved the Intermediate Level or have similar previous experience. This class will build upon the skills in both the Beginner and Intermediate Levels. Concepts and tactics will be introduced in preparation for playing in the league. Players who complete in and achieve this level are encouraged to play in the RHL. Players will be evaluated by instructors at the end of each session and encouraged to advance to the next Level or possibly repeat the same level. The average player will be able to play in the RHL (Adult Hockey League) at the Novice Level (C) by the completion of the 24-week sequence.